A man from the UK avoids jail time for his cannabis growing operation for the funniest reason. Apparently if you are living in the UK and growing cannabis illegally, you can skip jail by being terrible at it. One man escaped jail time on his illegal cannabis growing operation by failing to produce plants that were even worthy of harvesting. So it’s not illegal to grow cannabis in the UK it seems. It is only illegal to grow really good cannabis. The judge, lawyers and prosecutors all agreed that Joshua Hughes shouldn’t even be sentenced to jail for his illegal grow operation because it was a complete failure. They spared him the sad fate of having terrible cannabis plants and spending time in jail by giving him a suspended jail sentence and some community service work to do. So Joshua Hughes was obviously failing at his attempt to grow a decent cannabis plant, even though he might not even have known it at that stage. But it turns out that his inability to grow proper cannabis plants turned out to be his greatest blessing because it was his get out of jail free card. Joshua Hughes was reported to the police by his landlord after coming to investigate the house for a water leak. 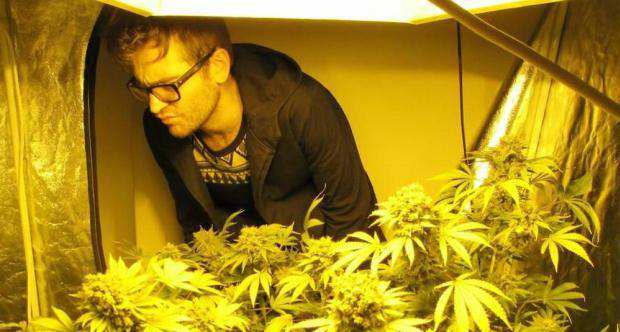 He found there 40 cannabis plants that Hughes was in the process of growing. They were set up with lighting, watering, and ventilation, and they also found the electrical meter had been bypassed, although Hughes denies having tampered with it. The judge agreed that this was “not a commercial grow because it did not come to fruition”, and on that basis Joshua Hughes was basically excused from jail. Judge Simon Bourne-Arton QC even added that he was suspending the sentence because of Hughes’ “incompetence”. Joshua Hughes says he purchased his growing kit, that came with everything he needed, from a car boot sale for 200 pounds. He apparently acquired all the information he needed in order to grow the plants by watching a YouTube video. However, given how unsuccessful his growing operation was (so unsuccessful it doesn’t even warrant jail in a country where growing cannabis is illegal), it’s probably safe to say that a YouTube video doesn’t cut it. Hughes said that one of the plants that was originally a part of his operation in fact died, and he was using chemicals to try and save the rest. This was apparently to no avail. In the end, Hughes received a 6-month jail sentence suspended for two years as well as 100 hours of unpaid work as a result of being found guilty of growing cannabis. What do you think about Hughes’ amazing escape from jail? Let us know your thoughts on our social media or in the comments section below.